"The Lid": Despite Promise, Clinton Foundation Took Foreign Donations LAST WEEK! Despite Promise, Clinton Foundation Took Foreign Donations LAST WEEK! It didn't even last a month. On April 15 the Clinton Foundation said that in the future foreign donations would be allowed from the governments of Australia, Canada, Germany, the Netherlands, Norway, and the United Kingdom but they would no longer take donations from other foreign countries. Three weeks after that pledge it was broken. According to the Washington Examiner during a conference in Marrakesh last week the foundation to pledges from foreign donors. 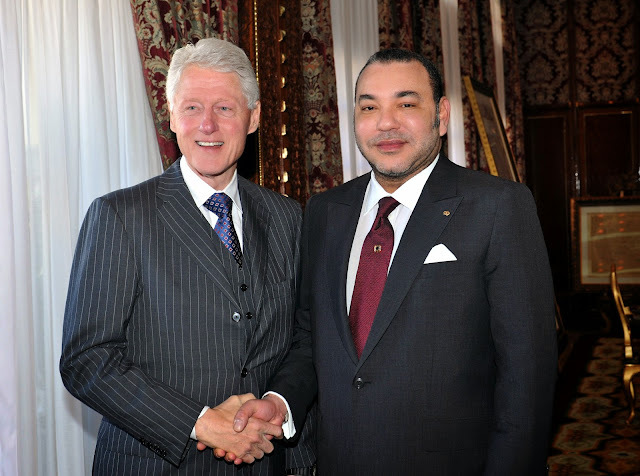 The Kingdom of Morocco was among the foreign entities that committed to new projects at the Clinton Global Initiative event, which drew dozens of big-ticket donors to the country for a three-day meeting headlined by Bill Clinton. Maybe Bubba thought Morocco merged with Canada or one of the other five countries deemed acceptable by the foundation board. Akwa Group, a Moroccan oil, gas and telecommunications firm, committed to building solar-powered water pumps in the region. Nuru Energy, which operates in East Africa and India, pledged to provide LED lights to villages without electricity. One company, state-owned phosphate exporter OCP, stirred controversy when the Clinton Foundation announced its sponsorship of the event given the firm's alleged exploitation in the disputed territory of the Western Sahara. OCP reportedly donated more than $1 million to fund the event, which took place at the Palmeraie Golf Palace. Attjariwafa Bank was also listed as a sponsor of the Clinton Global Initiative's operations in the Middle East and Africa. King Mohammed VI owns controlling stakes in the Moroccan bank. Forbes ranked Attjariwafa among the most influential Arab enterprises last year. Another company listed as a current Clinton Global Initiative sponsor is Laureate Education, which has come under fire in recent weeks after its involvement with both Bill Clinton and Hillary's State Department was revealed in Peter Schweizer's book Clinton Cash. The State Department named Laureate Education a "global partner" shortly after Bill Clinton signed on as its "honorary chancellor" in 2010, Schweizer wrote. If we didn't know before, we now know the expiration date on a Clinton promise is three weeks. Despite the Clinton cleanup crew's attempts to beat up on "Clinton Cash" author Peter Schweizer, this scandal is going nowhere.